Commandant Gen. Jim Amos made a big splash in the media during his Thanksgiving trip to Afghanistan, not only visiting Marines, but frankly assessing the future there. Significantly, he acknowledged to Associated Press reporter Bob Burns that the number of troops in Helmand province would drop “markedly” next year as part of President Obama’s planned drawdown of U.S. forces in the country. In many ways, those comments raise as many questions as they answer. 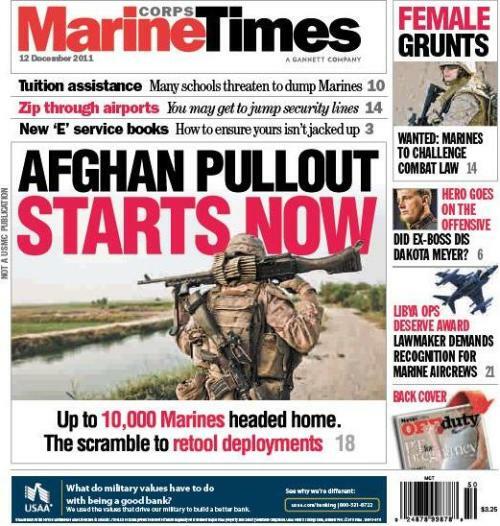 Marine Corps Times hashes things out in its cover story this week, outlining what options appear to be on the table for the Corps downrange and how the security situation in other parts of Afghanistan will contribute to the Marines’ future there. There’s also the question of whether the drawdown being accelerated in southwestern Afghanistan could have a role on the future deployment of Marine units. It’s entirely possible that the deployment of Marine units could be altered over the course of the next year, Marine officials said. The story hits newsstands today. You also can subscribe online to read it here now.